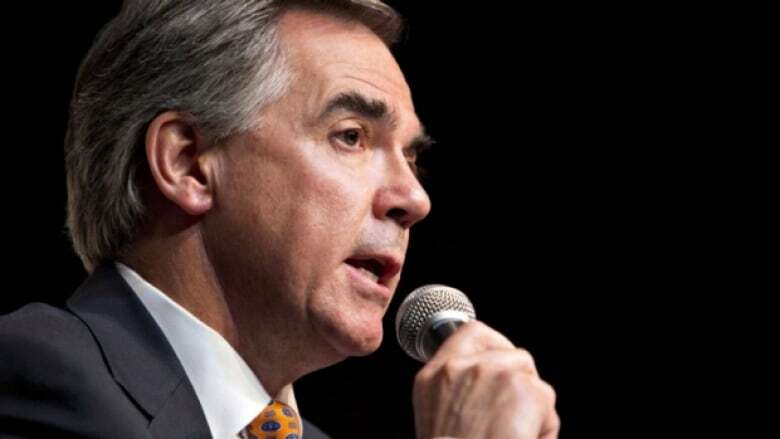 With five days to go before a provincial election and his party trailing in recent polls, Conservative leader Jim Prentice used a major fundraising speech Thursday evening to attack the NDP as potential killers of jobs and investment. "Make no mistake about the NDP," Prentice told an audience of supporters at the Edmonton Premier's Dinner, where single tickets went for $500 and tables for $5,000. "When you drill down into the policies that they are putting forward, you realize this is not a new NDP. "This is the same NDP that made our grandparents so hesitant." After more than four decades in power, the Progressive Conservative party appears to be fighting for its political life. Polls suggest the NDP have overwhelming support in Edmonton and substantial backing across the province. An exclusive CBC poll released Thursday morning suggests the NDP under leader Rachel Notley have 38-per-cent support among decided voters. The Tories polled at 24 per cent support, and the Wildrose at 21 per cent. In his speech delivered at the Shaw Conference Centre, Prentice warned supporters the NDP would increase corporate taxes "by 20 per cent" (Notley has said she would hike the business tax rate from 10 per cent to 12 per cent). Prentice said the New Democrats would put jobs at risk in businesses both large and small. The NDP would make Alberta's corporate tax rate higher than Quebec's, he said, and would erode "our Alberta advantage." He called the proposed NDP corporate tax hike "symbolic of a party that just cannot rid itself of a fundamental distrust of business and the creation of jobs in this province." Prentice also criticized the NDP policy on pipelines, saying the party would "kill any chance" for a Northern Gateway pipeline to move Alberta oil to the B.C. Coast. And the NDP, he said, would "not show up in Washington to fight for Alberta interests, such as the Keystone pipeline," which would, if built, carry Alberta oil to refineries in Texas. The United States Congress approved construction of the Keystone XL pipeline earlier this year. But President Barack Obama vetoed the bill. "We don't need a pipeline policy in this province that feels like it was scripted by Thomas Mulcair," Prentice said, referring to the federal NDP leader. "Fundamentally, the NDP could undermine the heart of Alberta's economy. And we must not let that happen." With that same CBC poll suggesting Notley's NDP is favoured by 57 per cent of decided voters in Edmonton, Prentice turned his attention later in the speech to Alberta's capital. Edmonton and northern Alberta have much at stake on Tuesday, he said, characterizing it as the most important Alberta election in decades. "How would Edmonton and this region fare if we did not have a government with a passion for free enterprise?" he asked. "What is the cost of a government that would be indifferent to the industries that propel our growth? In fact, policies that would slow down the growth that this city and everyone in it has worked so hard to achieve." During his speech, Prentice mentioned the Wildrose twice. He said that party's $9 billion in proposed cuts to government spending "cannot be done painlessly." He also warned the Wildrose is "simply not in a position, in this election, defect the NDP." He did not mention the Liberals at all.